PARKHAUS Performance & Parts was recently commissioned to build Miami's 4th RWB and it's a game changer. Starting with a 1989 Carrera 4, the team at PARKHAUS began to formulate a plan that included modifications to the Porsche's engine, suspension, exhaust, interior and paint. Along the way they kept one thing in mind, make it "tasteful". That's a word some might not think synonymous with Nakai San's work. Rather than pushing the envelope with aggressive, modern-motorsports-inspired touches, the latest build takes a more restrained, classically informed approach. Like most RWB builds, the new car is based on a late-model aircooled 911. In this case, the base car is a 964 Carrera 4. This car has been heavily backdated, including a long-hood conversion, early 911 front fenders, and a pre-'73 rear valence. Rather than an aggressive multi-tiered GT2-style spoiler, a simple duckbill occupies the rear decklid. 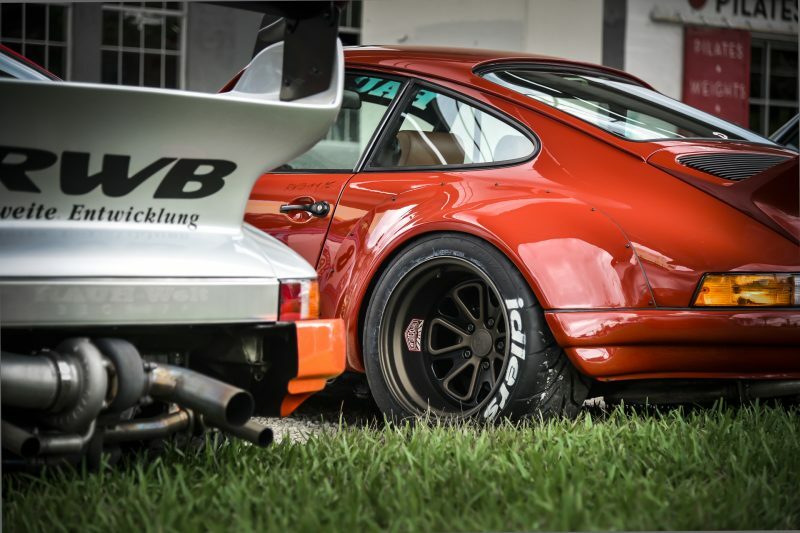 The front bumper is similar to a '73 Carrera RS 2.7, albeit with a deeper chin spoiler. The car even uses low-back early 911-style seats with separate headrests. Nakai-San's traditional elements are mostly intact, chiefly the large, bolt-on overfenders and upgraded lighting. This RWB is not all-show and no go, however. The client, a long-time PARKHAUS customer had previously commissioned a custom 3.8L powerplant for this Porsche, which included Mahle drop-in 3.8 pistons and cylinders, Carrillo 3.8RSR connecting rods, FVD headers, and tuning by Steve Wong. The suspension includes Bilstein PSS10 coilovers. The brakes, one of the hardest components in a 964 C4 to alter due to the Porsche's unique hydraulic system, remain stock. Not to downplay the rest of the build, but each time we look at this Porsche, it's hard to ignore the color. Peru Red is a mid-1970s vintage Porsche color, originally available on early G-Series 911s. While not perfectly contemporaneous to the bodywork backdate, it's very close. Compare photos of the finished car in the gallery below to the original Guards Red paintwork, as the difference is very striking. The wheels are Fifteen52 Outlaw 001s measuring 17" in diameter, and shod with 255 section Toyo R888 rubber at the front, and 355 at the rear. The dark bronze finish of the wheels contrasts the paintwork beautifully. Of course, being an RWB build, we do not expect this Porsche to please everyone. Frankly, we'd be shocked if any one Porsche pleased everyone. That is truly one of the beautiful things about Porsche as a brand; as good as any car might be off the showroom floor, they are still a blank canvas awaiting the owner's vision to make truly great. Whether as a race car, track car, or even as a daily driver, helping each POrsche find its purpose can be an adventure in and of itself. Kudos to ParkHaus and Nakai-San for making this extraordinary 964 a reality. Not a fan personally. Very much like the old pop rivet plastic or GRP panels we fitted onto performance Golfs, Renault’s, Fords etc back in the 60s, 70s and 80s. I am sure the owners love their restyled cars very much but as always it’s down to personal choice.